The average cost of memory care in Garland County is $4,712 per month. This is higher than the national median of $4,650. Caring.com has helped thousands of families find high-quality senior care. To speak with one of our Family Advisors about memory care options and costs in Garland County, call (855) 863-8283. About 23.7 percent of Garland County's 98,658 citizens are 65 or older, the age most vulnerable to developing Alzheimer's disease, Huntington's disease and other forms of dementia. Nearly 11 percent of Garland County seniors have been diagnosed with Alzheimer's disease and may require the services of an Alzheimer’s Special Care Units (ASCU). To treat those seniors requiring specialized care and supervision, Garland County has two Alzheimer’s Special Care Units. 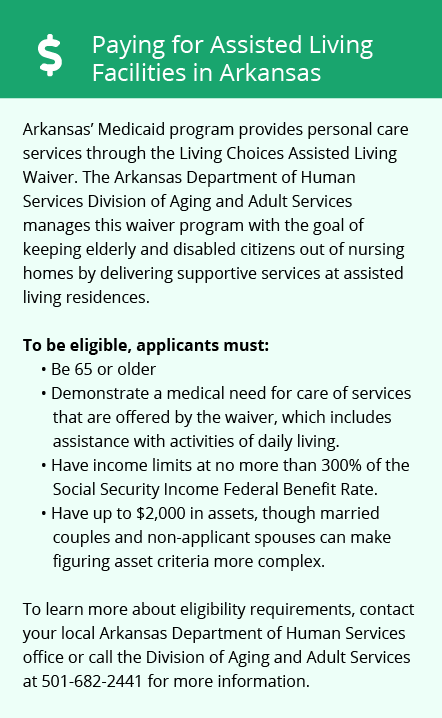 Arkansas regulates ASCUs, which are part of other long-term care facilities, through the Arkansas Department of Human Services, Office of Long Term Care. In Garland County, the cost of living is 80, lower than the Arkansas average of 84 and the national average of 100. Seniors in memory care facilities here may have a bit more money left over in their budgets. In Garland County, based on a scale of one to 100, the violent crime rate of 47 is much higher than the U.S. average of 31, and the property crime rate is 48, also higher than the national average of 38. Families of seniors in memory care should ensure that the facility has cameras, locks and alarms to keep their loved ones from wandering. Seniors in Garland County experience 219 sunny days per year compared to the national average of 205. Summer highs in July of 92 degrees and winter lows in January of 29 degrees make be tough for seniors sensitive to the heat or cold. According to the EPA's National Air Toxics Assessment, Fulton County has an air quality rating of 52, which is a bit lower than the U.S. average of 58. The assessment measures the impact of hazardous air pollutants on respiratory ailments and the risk of cancer and indicates that seniors with respiratory conditions may be less comfortable here than in cities with better air quality. Memory Care costs in Garland County start around $4,712 per month on average, while the nationwide average cost of memory care is $4,799 per month. It’s important to note that memory care rates in Garland County and the surrounding suburbs can vary widely based on factors such as location, the level of care needed, apartment size and the types of amenities offered at each community. Garland County and the surrounding area are home to numerous government agencies and non-profit organizations offering help for seniors searching for or currently residing in an assisted living community. These organizations can also provide assistance in a number of other eldercare services such as geriatric care management, elder law advice, estate planning, finding home care and health and wellness programs. To see a list of free memory care resources in Garland County, please visit our Assisted Living in Arkansas page. 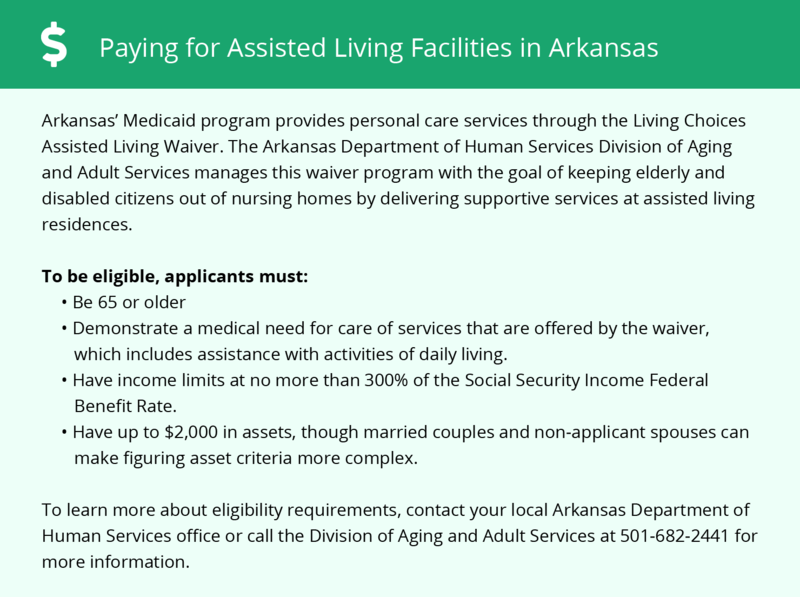 Garland County-area assisted living communities must adhere to the comprehensive set of state laws and regulations that all assisted living communities in Arkansas are required to follow. Visit our Memory Care in Arkansas page for more information about these laws.